Designs by Lisa Somerville: It's a Butterfly Thing! If you follow my blog or just pop in every now and then, you know I have a thing for Butterflies/Damask/Vintage images. When I was at Leadership earlier this year and we received the new SU Catalog, my friends Jeannette & Sheryl, picked out the stamps they thought I was going to order. There's still one in the book I haven't ordered that they thought I would, do you have any idea which one it is? Friends 24-7, was a sure pick, I love everything about those stamps, so what greater thing to pair them up with then the Beautiful Butterflies Bigz Die and the Kind Thoughts Flourish. If you haven't seen the Kind Thoughts Flourish - check it out it's in the Decor Elements Catalog, along with some other cool stencils! Again for this card, I used this weeks SCS Sketch. The Stencil was stippled in Chocolate Chip on Bashful Blue card stock. 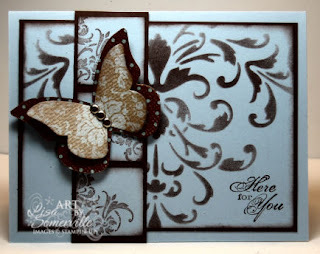 The Damask from Friends 24-7 was stamped off in Chocolate Chip before stamping. 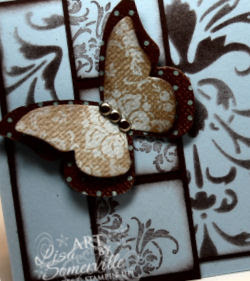 The Beautiful Butterflies we die cut from Parisian Breeze Speciality Paper, I adhered them to the card using dimensionals, but also placed a dimensional under the top layer wings to give it a bit of lift. Wow what an awesome card! Makes me want that butterfly die! I love the colors, the paper, and everything about it. Thanks for sharing! So if I guess it right do I win this fabulous creation? You know I think it's Classic Sketches! WOW! WOW! WOW! this is so sophisticated and beautiful! WOW! This card is awesome !! Love it ! !